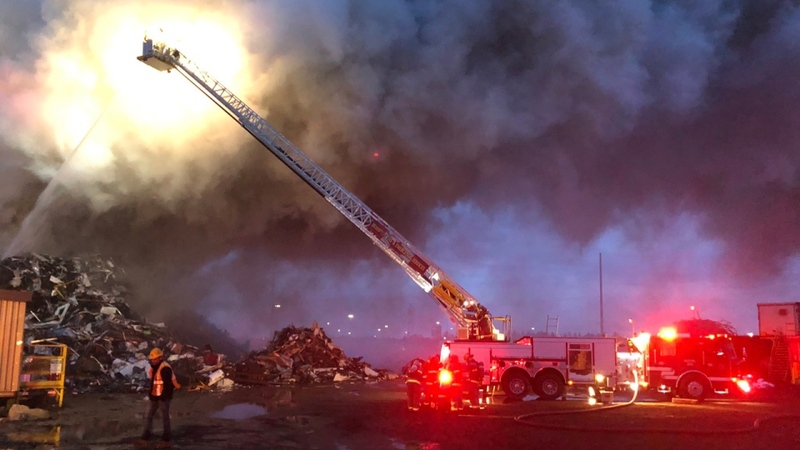 Firefighters in Brampton battled a stubborn blaze at a scrap metal yard that started Thursday evening and stretched well into Friday. Fire crews were originally called to the yard at 331 Intermodal Drive, in the Highway 407 and Goreway Drive area, at 5:19 p.m. Thursday. Crews brought ladder trucks, a hazardous materials team and drones to fight the blaze, which subsided but was still smoldering by daylight on Friday. Brampton Fire Platoon Chief Ed Davis said crews would be at the yard until Friday midday or early afternoon. A section of the neighbourhood was ordered to shelter in place for a brief time Thursday night but the Ministry of Environment later found that emissions from the blaze were within acceptable limits. Officials say there is no concern about chemicals at the scene posing a risk to the public. An extensive cleanup is expected once the blaze is fully extinguished.